Well, the Scheckster is still under the weather, so not much to report. I went to his school today and picked up his books, so we're doing a little bit of "home school" so that he won't be too far behind when he returns to school. So far, it's been going surprisingly well. Although, it's pretty easy to get him to do homework when he knows that as soon as he finishes one assignment, I'll let him watch a little bit of "Tom and Jerry Kids". Twenty-four hours ago, I had no idea that such a show existed.... It's pretty much exactly what you would think - Tom and Jerry are little. And they still fight. I suspect that this is a throwback from the late 80's - early 90's when "baby everythings" were all the rage....Muppet Babies, Tiny Toon Adventures, etc. I learned to knit when I was 7, and never looked back. 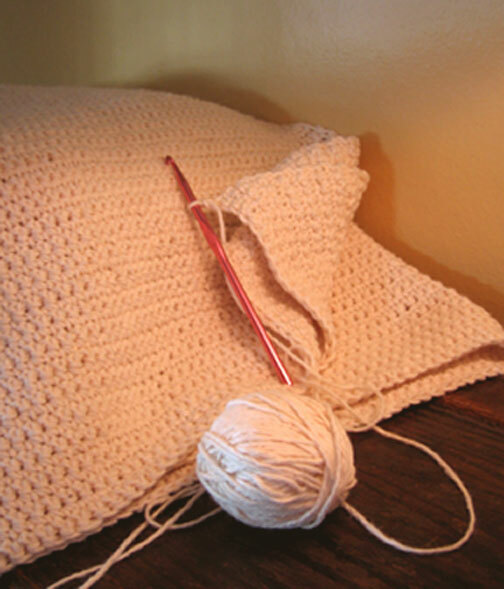 Therefore, I never learned to crochet. I had the knitting thing down pretty well, and the whole concept of "I'm only working with one hook instead of two needles" really threw me for a loop. 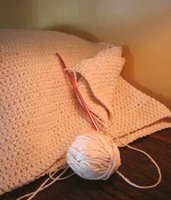 A few years ago, during the Christmas holidays, I was at my parent's house and my mom was crocheting late one evening. When I mentioned to her that I didn't know how, she was amazed. She immediately made us get bundled up and drove us to the 24 hour SuperWalmart, where she bought me some rudimentary supplies. We then went home and the lessons commenced. She taught me one simple stitch - maybe the single? - I'm not sure. I started out making a potholder. Then another. After a few I was bored, so I made a little blanket for one of Scheck's stuffed animals. He loved it so much that he asked me to make him a blanket. Well, even though I was ready to abandon crocheting for good, how could I refuse that? So I go back to WalMart and buy a few more big-old cones of this off-white cotton yarn. It's inexpensive, it's neutral, and there is a ton of it. I decide that I am going to make a blanket for his bed. Yes - you real crafty-grrrls out there know what a fool's errand this is that I was embarking upon, but I had no idea. I measured off the dimensions of a twin-bed blanket and cast on enough stitches. And I get to work. And I work, and I work, and.... Years later, I am still working. Ay yi yi. Maybe I'll be finished by the time he goes to college. It takes me about 45 minutes to complete a row. And it takes about 4 or 5 rows to make an inch. ARGH! If only I could make myself do about an inch a week, I'd be done - well, in about a year I'd be done. But it is just so boring! If only I had used a bigger hook! Or a different stitch! Maybe it would be progressing much faster. I keep telling myself to look on the bright side - when I'm done, it'll be a family heirloom, right? (Even though it looks suspiciously like a blanket you could buy at Bed, Bath and Beyond fairly inexpensively?) Also, it's good that he's not a little guy anymore - since the blanket is the heaviest thing ever and could probably crush a toddler under its weight.